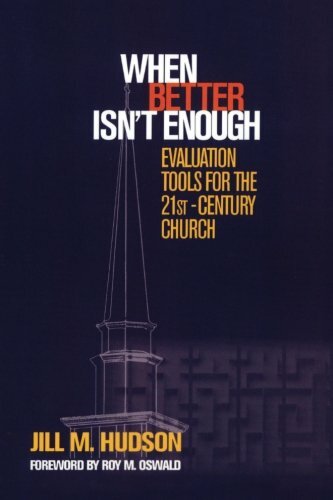 When Better Isn't Enough: Evaluation Tools for the 21st-Century Church est le grand livre que vous voulez. Ce beau livre est créé par Jill M. Hudson. En fait, le livre a 182 pages. The When Better Isn't Enough: Evaluation Tools for the 21st-Century Church est libéré par la fabrication de Rowman & Littlefield Publishers. Vous pouvez consulter en ligne avec When Better Isn't Enough: Evaluation Tools for the 21st-Century Church étape facile. Toutefois, si vous désirez garder pour ordinateur portable, vous pouvez When Better Isn't Enough: Evaluation Tools for the 21st-Century Church sauver maintenant. Many sociologists and a growing number of church scholars have noted that we live in a time of transition―from the modern era to the postmodern. Whenever a shift of this magnitude occurs, it leaves all of life, including the church, in flux. We instinctively strive to stabilize the situation by re-establishing what has worked in the past. Increasingly, however, congregations are finding that the same old things done harder or better don't seem to make a difference. Author Jill Hudson argues, "We must identify new criteria for success, and perhaps even for faithfulness, and hold ourselves accountable to them." Approaching the postmodern era as a tremendous opportunity, Hudson identifies 12 characteristics by which we can measure effective ministry for the early 21st century. Based on those 12 criteria, Hudson has created evaluation tools, "an early measuring stick," to help congregations evaluate their work in this new era. Not everything of the past is ineffective and best discarded, she says, nor will everything we try in the future be successful. But by faithfully listening for God's guidance and carefully evaluating progress using Hudson's tools, looking at the ministry of the whole people of God as well as that of the professional staff, congregations can improve their ministry, help members and staff grow in effectiveness, deepen a sense of partnership, and add new richness to the dialogue about the congregation's future.